France is to get the world's fastest broadband satellite, thanks to Eutelsat and the French government. The 70Gbps KA-SAT satellite, scheduled to go online in 2010, will bring high speed (ADSL 2-level) web access to rural communities and other unserved 'grey' areas. The new satellite is part of the French government's 'Digital France 2012' initiative, which aims to bring broadband to every French home and business over the next four years. Eutelsat's consumer satellite broadband service uses bidirectional 'Tooway' technology similar to that already used by satellite broadband companies in the US. Tooway requires a special modem and a 67cm antenna, and should be able to match ADSL for both price and speed when it's up and running. 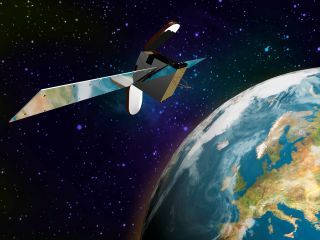 America is scheduled to get the next high-speed sat, the ViaSat 1, in 2011.